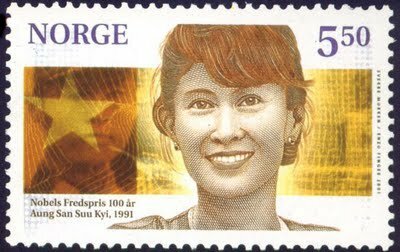 Nobel Laureate Aung San Suu Kyi will finally be able to deliver her Nobel Peace Prize address in Oslo after winning the prize in absentia 21 years ago. She now feels able to make her first trip outside her native Burma (now Myanmar) in more than two decades, and her destination is Norway before she moves on to the UK. Norway’s Foreign Ministry confirmed a report on Norwegian Broadcasting (NRK) Wednesday that Suu Kyi, released from house arrest and already voted into Myanmar’s national assembly following government reforms last year, will visit Norway in June. No date has been set yet, but her closest adviser U Nyan Win also confirmed the upcoming visit. Svein Atle Michelsen of the Foreign Ministry told news bureau NTB that Suu Kyi discussed a visit to Norway during a telephone conversation with Norwegian Foreign Minister Jonas Gahr Støre on Sunday. Norway lifted economic sanctions against Myanmar over the weekend and also met Myanmar’s railroad minister in Oslo on Tuesday. Støre was in Yangon (formerly Rangoon) in January and had repeated Norway’s long-standing invitation to Suu Kyi from Prime Minister Jens Stoltenberg. All of his predecessors have invited her as well, not least one of Suu Kyi’s biggest supporters, former Prime Minister Kjell Magne Bondevik, as had the Norwegian Nobel Committee. She didn’t dare leave Burma at the time she was awarded the Peace Prize for her struggle for human rights under the country’s oppressive military regime. She faced no restrictions on leaving her homeland, but feared she wouldn’t be allowed to return. Her late husband Michael Aris and their two sons Alexander and Kim accepted her Peace Prize on her behalf and it was decided that she would hold her Nobel address when she was finally free to do so. Now she is, and Bondevik believes she wants to visit Bergen as well, where she won the Rafto Prize for human rights before winning the Nobel prize. The Norwegian Nobel Institute has earlier said it would host a new, abbreviated ceremony in her honor along with a banquet when she finally was able to travel to Oslo. Bondevik, who now heads the Oslo Center for Peace and Human Rights, was among many on Wednesday who expressed joy and relief that Suu Kyi finally felt free enough to travel. She earlier told NRK that she wanted to celebrate her birthday in Norway one year. It falls on June 19. Suu Kyi plans to travel from Norway on to the UK, where she once studied at Oxford and where her family lived while she was under arrest. 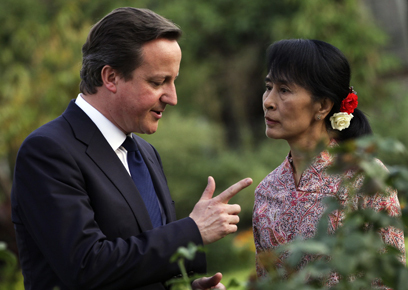 British Prime Minister David Cameron made the first visit by a western government leader to Myanmar just last week.